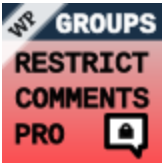 Groups Restrict Comments Pro allows to post and read comments based on group memberships. The plugin is an extension based on Groups – please make sure that it is installed and activated. To install the extension, please follow these installation instructions. 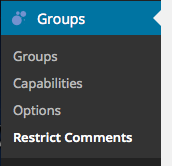 Go to Groups > Restrict Comments, review and adjust the settings as needed. In this section you can restrict who may post comments for each post type. Choose one or more groups that are allowed to post comments on entries of the corresponding post type. Here you can limit who is allowed to read comments for each post type. Choose one or more groups per type as desired. If you want to control who may post or read comments per post, then you must enable this setting for the post type here. After you have checked the post type and saved the settings, a new section appears on posts of the enabled types. 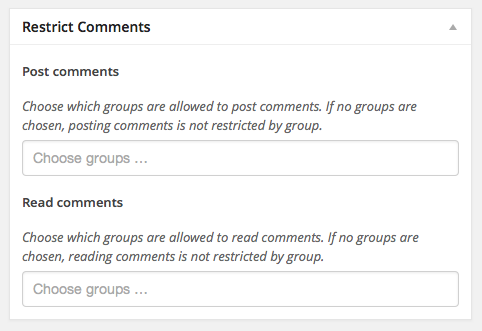 For each post, you may then choose which groups are allowed to post comments and which groups are allowed to read comments. This is an extension for and requires Groups.